Starting next month, patients at hospitals in Nebraska and South Dakota will receive a little extra comfort following a breast biopsy procedure thanks to a generous donation from the Kathy and Gary Gates Foundation. 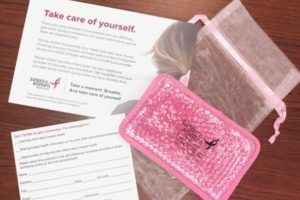 Breast biopsy patients will receive a ‘comfort pack’ including: a reusable plush cold compress, information and resources about breast health, and a way to provide anonymous feedback on the materials. The goal is to provide comfort and support after a medical procedure while also making patients feel good about making their breast health a priority and noticing a change in their breasts. Knowing how our breasts look and feel normally allows us to notice when changes occur in the breasts and know when to contact a health care provider with questions. Komen Great Plains would like to acknowledge its partners: Nebraska Medicine, Methodist Estabrook Cancer Center, CHI Health, Bryan Medical, Mary Lanning/Imaging Center, Columbus Community Hospital and Dakota Radiology. The comfort packs were originally introduced in January 2018 when four hospitals – Nebraska Medicine, Methodist Hospital, and CHI Health in Nebraska and Dakota Radiology in South Dakota — partnered with Komen Great Plains to pilot the comfort packs. Given the positive feedback from patients and the hospitals, Komen Great Plains worked with the Kathy and Gates family to extend the comfort pack program across Nebraska.